The Second Death. Is That for People Who are Born Again? What is "the second death" spoken of in the Book of Revelation? Is it only for those who are born twice? In this part 2 of this series on Birth, Death and Resurrection (part 1) we will look at the question of the second death and how it fits into the cycle of life, death and resurrection. 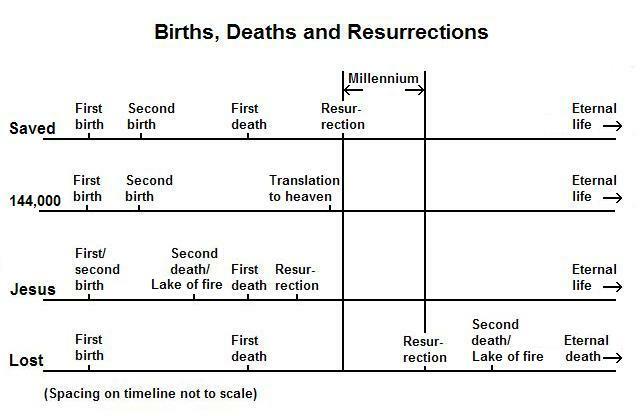 We are trying to understand the relationship between the different births, deaths and resurrections spoken of in the Bible as illustrated by this diagram. First let's understand the first death - it is separate from the second and final death. The following verse is a reference to believers not dying the second death as they obviously do die the first death. Jesus spoke of the first death as a sleep, recognizing that there would be a resurrection for all that "sleep." That definition "the wages of sin is death" is not referring to the first death as even those who will be saved die that death. Also, note that "death" is the opposite of "eternal life." The lost will not have eternal life in some place of punishment or anywhere else. When they die the second death they will stay dead forever. Their existence will end with no return. The second death is not, by definition, a death from which there is no resurrection. While the lost will not be resurrected from the second death, God could resurrect them if it was His plan to do so. Jesus died the second death and was resurrected. Jesus tasted death for every man - He paid the penalty for all so that no one has to die. However, that payment is only for those who accept it. The death referred to in this verse could not be the first death because even the righteous experience that for themselves. His statement "why hast thou forsaken me?" shows that He experienced that total separation. Jesus came through the experience of the second death while still physically alive. His words "it is finished" indicated that the experience was over, the sacrifice for sin was complete. It is interesting that Jesus, while He was on the cross, quoted both the first and the last verses of Psalm 22. Note that with the "Into thine hand I commit my spirit" another thought is associated: "thou hast redeemed me." See the Lake of Fire series of pages for more on this. Again, Rev 21:8 defines the lake of fire as the second death. It is an experience, not a place. Jesus died the second death while on the cross; He was not in a physical, literal "lake of fire."